NASA's Mars rover Curiosity snapped this picture of the Martian moon Phobos transiting the sun on Sept. 13, 2012. 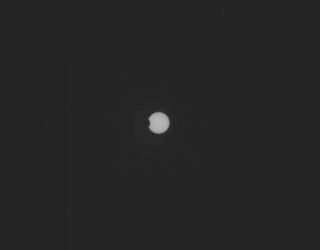 NASA's Mars rover Curiosity has snapped stunning shots of a brief partial solar eclipse on the Red Planet, capturing images of the tiny Martian moon Phobos crossing the face of the sun. Curiosity took the photos of Phobos on Thursday (Sept. 13), roughly five weeks after landing inside the Red Planet's huge Gale Crater on Aug. 5. The images, taken with Curiosity's Mast Camera (Mastcam), look very different than the solar eclipses on Earth that we're used to. That's because our planet's moon is about 2,160 miles across (3,476 kilometers), big enough to block out the solar disk entirely when Earth, moon and sun are perfectly aligned. Even partial eclipses of the sun by our moon are impressive celestial events. Mars' other moon, Deimos, is even smaller and farther away from the Red Planet's surface than Phobos, so it blots out even less of the sun when crossing — or transiting — the solar disk. Many scientists think both Phobos and Deimos are asteroids that Mars' gravity captured long ago. The eclipse photos were no lucky occurrence. Curiosity scientists and mission managers had been planning to snap them for a while, and the rover will likely take more such images in the coming days and weeks. "Actually, there are I think three opportunities in the next month or so where we'll image those transits," Curiosity mission manager Jennifer Trosper, of NASA's Jet Propulsion Laboratory in Pasadena, Calif., told reporters Sept. 12. "They're neat opportunities to see a unique scientific observation," Trosper said, adding that NASA's Spirit and Opportunity rovers, which landed on the Red Planet in January 2004, also have taken similar photos. Such transit shots can help refine researchers' understanding of the orbits and orbital evolution of Phobos and Deimos, scientists have said. But the gee-whiz factor may be reason enough by itself to point Mastcam skyward. The $2.5 billion Curiosity rover is about six weeks into a two-year mission to determine if the Gale Crater area could ever have supported microbial life. Curiosity spent much of its first month on Mars stationary, as mission scientists and engineers checked out the rover's systems and 10 science instruments. But the six-wheeled robot has hit the road recently. From Friday through Monday (Sept. 14-17), Curiosity logged 282 feet (86 meters) on the Martian surface, bringing its total odometry since landing to 745 feet (227 m), rover team members said. Curiosity is on its way to a site called Glenelg, where three different types of Martian terrain come together in one place. But its main science destination is the base of Mount Sharp, the 3.4-mile-high (5.5 km) mountain that rises from Gale's center. Mars-orbiting spacecraft have spotted signs that Mount Sharp's foothills were exposed to liquid water long ago. Curiosity could be ready to turn its wheels toward these interesting deposits — which lie about 6 miles (10 km) away — by the end of the year or so, researchers have said.